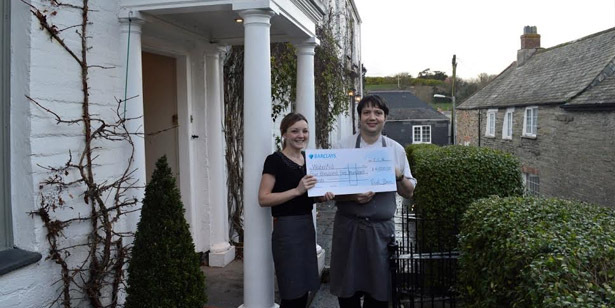 We are very excited to reveal that our bistro in Padstow has raised £4,500 for WaterAid from the charity lunches we held in November, nearly doubling the total we raised in 2014. Some of Rick’s favourite fish dishes featured on the menu as well as new recipes ‘From Venice to Istanbul’, including plaice alla Carlina, Jerusalem artichoke soup, and grilled hake on pommes sarladaises. On sharing our news with WaterAid, Asma Rafiq, Corporate Partnerships Manager of WaterAid commented: “We are delighted to receive this wonderful donation from St. Petroc’s Bistro. Not only have they supported us through their excellent charity lunches initiative, but they continue to support us by serving Belu Water, which donates 100% of its profits to WaterAid. St, Petroc’s donations will allow WaterAid to deliver life-saving water and sanitation projects in some of the most rural communities in the world- so on behalf of everyone here, and most importantly on behalf of our beneficiaries, we want to extend our deepest thanks for this generous contribution”. It’s been fab to support WaterAid again this year and to see how successful the charity lunches have been, so a huge thank you to everyone who attended the lunches and supported such a brilliant charity. Keep your eye out for our charity lunches at St. Petroc’s Bistro next year but if you can’t wait that long, come along and try our set bistro lunches when you’re next in Padstow.